It had been more than a year sice India last won a Test outside India after the win against England at Lords in 2014. But things changed. The first win came just seven seven balls after Lunch on fifth day of the 2nd Test between the Lankans and Indians as Chameera was clueless in response to Mishra’s cunning googly. Rod tucker dictated the decision and ended the last ever international matych for Sri Lankan great Kumara Sangakarra. Electing to bat first after winning the toss, Captain kohli and Co. put up a decent total of 393. They were led by youngster KL Rahul’s 2nd test ton in just the 4 matches that he has played followed by half-centuries from skipper Kohli and Rohit Sharma. Kohli 78(107) and Sharma 79(132) handled the Lankans beautifully. Keeper Saha contributed a gritty knock of 56 off 117 balls too. For the Lankans it was chameera who picked up two wickets then followed by kaushal who got one. Now Sri Lanka, in to bat, managed just 306 in 108 overs as Indians grabbed up the tail like a ‘free gift’! Skipper Angelo Matthews played a Captains knock of 102 (167) with 12 hits to the fence. His 6th test ton. Opener kaushal Silva chipped in with a handy half century (51) and later lahiru Thirmanne (62) supported the team score. Otherwise the rest of the lineup was a disappointment! Sangakarra’s 32 was the best score in the rest of the lineup. 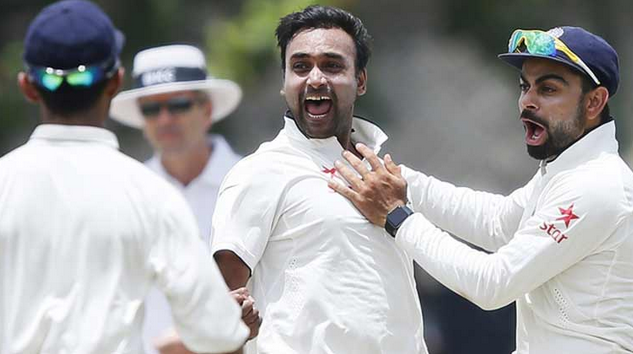 For India it was leggie Amit Mishra this time, as he picked figures of 4-43. Ishant Sharma and Ashwin got two each. While Binny go his maiden wicket and Yadav got one wicket too. In India’s second innings, Lanka started well dismissing rahul cheaply for 2 but the joy was shortlived! Dhammikka Prasad got one to nip in back, dislodging the Karntaka batsman’s leg stump. Ajinkya Rahane then came in and set up the innings brilliantly. Leaving the good ones and targeting the odd bad balls, he was scoring on will. He quickly got to his ton off 201 balls. Partner Vijay supported with a patient 82. India finished on 325/8 in 91 overs handing the Lankans a target of 413 runs. In response Sri Lanka were bundled out for just 134, Ravi ashwin picking up his 12th fifer. Karunarathne was the highest scorer from his team with 46. KL Rahul was awarded the man of the Match for his ton and rightly so.